Just after their 99th birthday this week Leeds United Football Club have proudly announced the first of several exciting events to celebrate 100 years of the club, bringing hometown heroes Kaiser Chiefs back. The band behind million-selling debut album ‘Employment’, number 1 single ‘Ruby’, number 1 album ‘Education, Education, Education and War’, and anthems such as ‘I Predict a Riot’ and ‘Oh My God’, will be returning home on Saturday 8th June at Elland Road Stadium, the stadium they headlined in 2008. 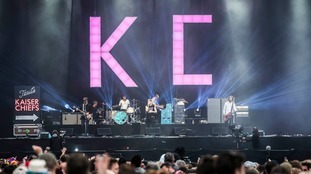 Kaiser Chiefs will be supported by a stellar bill including London indie-rockers The Vaccines who have previously headlined Millennium Square in Leeds, as well as Sheffield sensations The Sherlocks who exploded onto the indie scene over the last two years and now sell out huge rooms across the country. Last time we played Elland Road it was a BIG celebration. A great gig for the city. And promotion for the club. Well nearly. 10 years later it’s time for another go. We are really excited to be bringing the Kaiser Chiefs back to Elland Road as a part of our Centenary celebrations and re-establishing Elland Road as a recognised major concert venue. "The last time the Kaisers played Elland Road it was an incredible show and this time around with the strong support bill of The Vaccines and The Sherlocks this should be another amazing night at Elland Road. Club Season Ticket Holders and Members will be able to access a special pre-sale ticket link from Wednesday 24th October at 10am.